Facebook Scrapbook lets children inherit a digital identity. Facebook is emerging as the “modern day baby book,” and the social network wants to keep it that way. 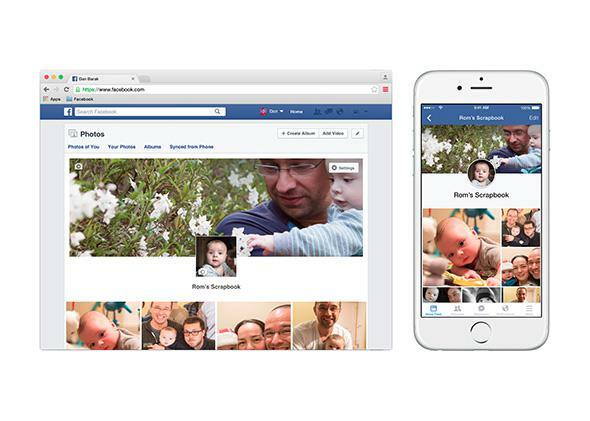 Last week, it rolled out a feature for U.S. users called Scrapbook that allows parents to use a designated tag to compile baby photos in one place and share them with their partner’s Facebook friends as well as their own. To take advantage of this feature, users must explicitly identify their relationships on their profile. Parents can create scrapbooks only for children they have listed in the “Family and Relationships” section of their profile. If the relationship is added through the Scrapbook tutorial, it is only visible to the user by default. Parents can only co-own a scrapbook with the partner they have identified in their relationship status. Given the value parents place on baby pictures, the feature seems bound for popularity. Parents get a virtual shoebox to hold their baby pictures, and Facebook gains more data on how its users are connected to one another. By tying precious childhood memories more cohesively to its platform, Facebook is positioning itself to be just as relevant to the next generation as it is today. Children whose parents create scrapbooks don’t simply inherit a digital identity; they inherit a digital identity within Facebook. Compiling baby pictures in one place also makes it easier for children to review what their digital presence on Facebook looks like, once they’re old enough to understand what that means. The company told TechCrunch that it’s looking into how parents can give the child control over the scrapbook once he or she turns 13 and can legally join Facebook. This idea of control comes up often when considering baby pictures, though I’ve argued that control may not be the best paradigm to approach managing a child’s digital footprint. The feature allows parents to use a custom tag to link pictures to the scrapbook. The tag can be the, “child’s name, initials or something fun,” according to the company blog post. Facebook has drawn fire for its insistence that people use their “authentic names” on the platform. Of course, babies aren’t officially on Facebook, but the fact that Facebook is encouraging parents to use something other than the child’s name as a tag suggests the network acknowledges that some parents may feel like keeping their child’s name private. This reflects one of many decisions that parents nowadays must make when it comes to their child’s digital footprints: Do they want to share photos of their child online at all? What types of photos do they feel comfortable sharing and not sharing online? Do they want to identify the child online? Do they want others posting photos online? Not only should parents consider their own opinions when it comes to these questions, but they should also communicate these preferences to their friends and family to minimize any surprises or awkward requests to remove a baby photo. For nearly as long as cameras have existed, parents have enthusiastically snapped photos of their children. As these pictures have migrated from leather-bound albums to albums on a screen, the audience for such pictures has grown. Facebook’s scrapbook feature gives parents a way to organize their child’s digital footprint on Facebook. Hopefully, it’ll also prompt some conversations among parents about what kind of digital footprint they want their child to have.